• How can we ensure that our democracies are capable to handle the challenges of our nations and our globalized world of now seven billion people? • How can we ensure that they are able to create balanced and stable societies in which everybody can achieve a certain degree of well-being? • How can we optimize our democratic policy making systems? These are some of the fundamental questions the model aims to answer. For a graph of the model click on the thumbnail to the right. The model highlights first of all that we, as citizens, are the highest sovereign in a democratic nation. It is, therefore, us, the citizens ourselves who shape or – at least – should be shaping the policy making system in a democracy. Only if we ourselves shape and control the performance of the policy making system, can we be sure it serves the well-being of all citizens equally. A fundamental understanding behind this proposal is that no system works without effective control, no power plant, no corporation, and no policy making system. Our present control systems, however, elections, parliaments, the media, or specific control institutions such as national audit agencies, do not establish the effectiveness of our policy making systems. To make our democracies effective, wider society in each country needs to control them effectively. Citizens assemble power and adequate resources to shape and influence the policy making system (in a democratic fashion) by joining together in the suggested Citizens’ Control Association. 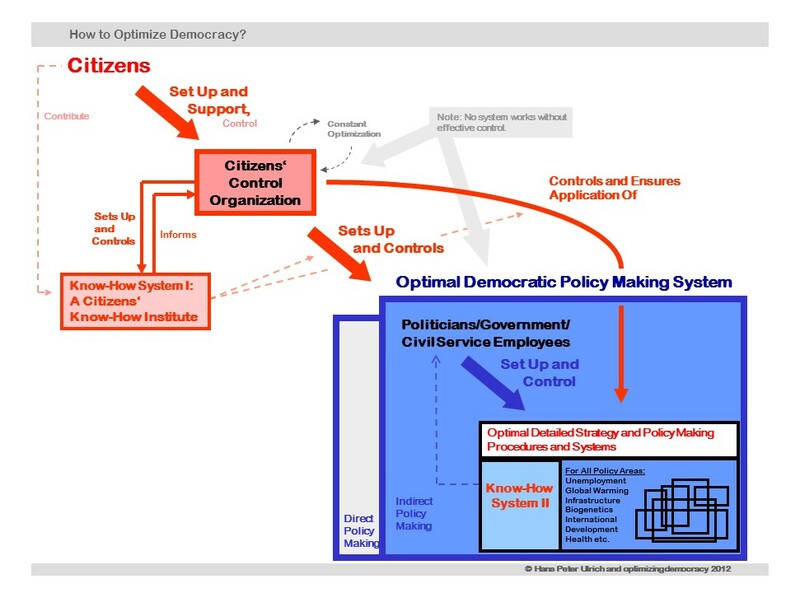 With the help of the optimal know-how the citizens’ organization works to set up the optimal policy making system, the blue box in the bottom right corner of the graph. Reflecting the demands for more “direct democracy” put forward in many parts of the world, we suggest that the overall democratic policy making system will probably consist of two major elements: A direct democratic policy making system for all policy making issues on which we as citizens can in fact decide directly, and the indirect democratic policy making system for all issues for which we will still need experts to take policy decisions on our behalf. In our complex global world this indirect policy making segment is likely to remain the more important section of the policy making system by far. One task of the citizens’ control organization will be to decide precisely which policy issues can best be handled by which one of these two systems. The citizens’ organization will have to optimize the performance of both, the direct and the indirect policy making system.